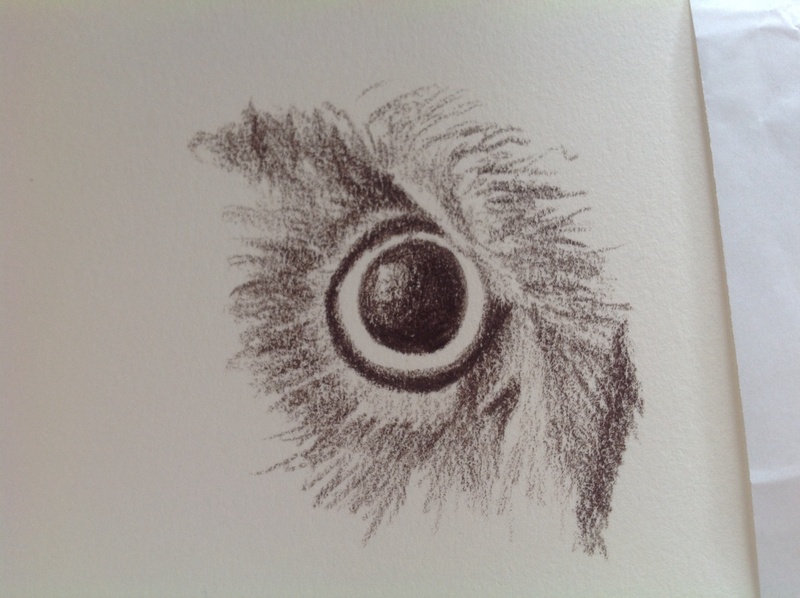 E is for Eyeball…and what a photo to sketch! Inspired by Carmel at http://carmelcampbell.wordpress.com, I thought I’d try my own eye first, but I wasn’t happy with that one, so I shall try, try again another day. I couldn’t resist giving it a try. Had to cover up the first sketch of my eye on the right there, sorry about that. Here again, I could have spent all morning continuing this one out and just drawing the next layer of feathers, and the next, but alas, the office (not to mention the shower!) beckons. What amazing creatures owls are. Nature continually inspires me; I can’t look out my window or even run errands without wanting to draw something I’ve seen. This was done with a walnut brown Polychromos colored pencil (by Faber-Castell – German engineering is real, people!) in my 3×5″ HandBook sketch book. I have to once again highly recommend the Polychromos pencils for anyone even remotely interested in exploring that medium. Once I pick one up and start drawing, I never want to stop. Thanks for checking in with me today. I’ve already found a gorgeous photo of a beautiful creature to draw for the letter F tomorrow. I can’t wait to try it! See you then! < D is for Dog! I LOVE this eye. you did a fabulous job on this. wow! 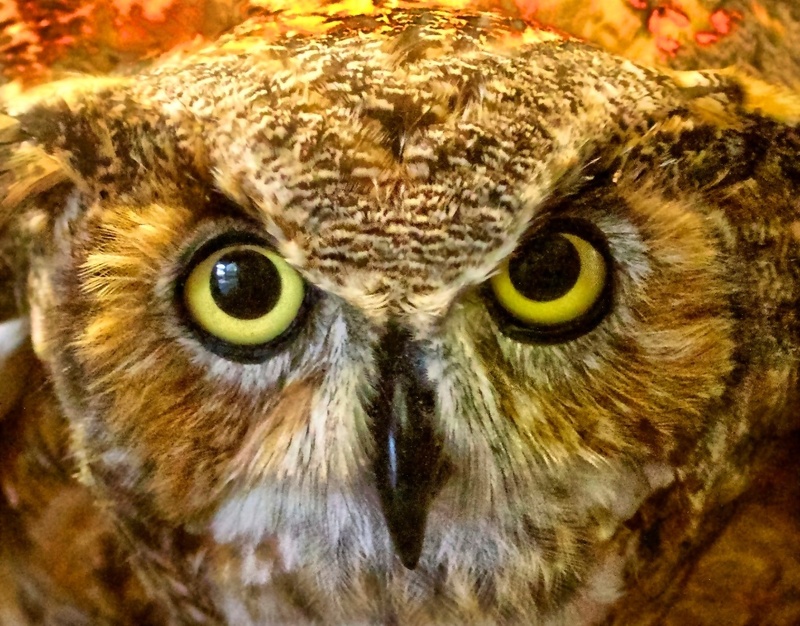 Owls are amazing creatures and you did the eye justice. Isn’t PMP a great site? fabulous for artists. Thank you so much, Rachel! Yes, I love that site. I heard about it from The Frugal Crafter. I really need to give her some credit, because without her tutorials on watercolor, I probably never would’ve even thought about trying to produce art on a regular basis. She makes everything look so easy. Thanks again for your kind compliment! Wow, thank you! Thanks for following me. I’ve always wanted to write, and I have a feeling your updates will inspire me. I certainly hope so! My goal is to not only improve as a writer myself, but to create more writing prompts this year for other writers. I have a few from last year listed under my “Fiction” tab in my main menu if you are interested. That’s awesome. I’ll definitely take a look. Thanks! My pleasure. I hope they spark some creativity. Ooh, I can see they’ll be terrific. Thank you! Have you heard of a book called “the 3 AM Epiphany” (or something like that)? Lots of great prompts there too. No I have not heard of it but I will look it up! Thanks for the suggestion. Glad I could help inspire you! And you have the right title. There is also a 4am edition, both books by Brian Kiteley. That’s right. The 3am one is better. Great job with that eye: expressive! Eggs are good to learn how to make subtle rendering on faces. Thanks, Victoria. That’s a great tip also. Wow! I love it. You are inspiring me. Polychromos pencils, eh? I need to try different media, maybe that’s where I’ll start. Yes! Seriously. http://Www.dickblick.com is usually the best price but Amazon can be about the same or a bit better, depending on the shipping. Also not sure what paper you’re using but if you get a HandBook sketchbook and use those Polys…..perfect marriage of paper and medium IMO. I’d love to see if you get similar results! Blick has both and amazon probably has those HandBooks too. 3×5″ book fits in a pocket, and the paper is great. Even takes light watercolor washes. Looking forward to following your progress! Wow! I wish I could do that as well as you can. Thanks for sharing your talents! Wow, what a kind thing to say. Thank you so much! Nice eye! Eyes are so interesting and all so different in animals. You captured the owl’s eye! I agree with you on the Polychromos. I have always love Prismacolor and have a lot on hand as I worked in colored pencil for years. However, the last time I purchased a Prismacolor and sharpened it or tried to sharpened it, it broke continually. Unfortunately they have moved their production facility. I’d heard that also, which is why I went with the Polys. Thanks so much for your comment. Eyes really are wonderful. I love drawing human eyes too, as I’m working through a portrait series in the latest alphabet. I like your eye. I find that once I get the eyes down, the rest of the drawing just sort of comes together. Thanks for the information about the Paint My Photo Website. I have been looking for some photos of house sparrows and they have a few there. Thanks, Nancy. That’s a great site. I’m glad it helped you. So much fun. You caught the eye wonderfully. I have no heard of the alphabet challenge, what a great idea. I am working on the 365 day challenge now, but I mix in the alphabet to just to spice it up. Thank you! Have fun with it!! What an excellent choice for ‘E’, and what a marvelous model. Very nice detail.